One of Gary Fisher’s more affordable line of bikes, the Advance Disc great for missions on or off road. Check out the review for more information on this great bike by Gary Fisher. Shifting is a little rough from time to time, but most of the components of the Gary Fisher Advance Disc are of decent quality. 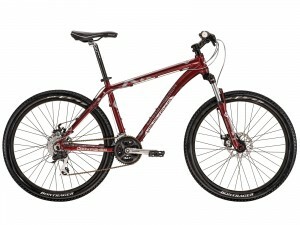 This hardtail comes in attractive crimson red design and is available at a good price. Where to Buy at a Discount? Get the best deal on the Gary Fisher Advance Disc nearest you with their their dealer locator. See the rest of our Gary Fisher reviews. This entry was posted in Gary Fisher, Mountain Bikes and tagged advance disc, Gary Fisher, LDS mission bikes, mountain bike. Bookmark the permalink.